New York Jets NFL Draft News - Tanking Does it Even Work Long Term? 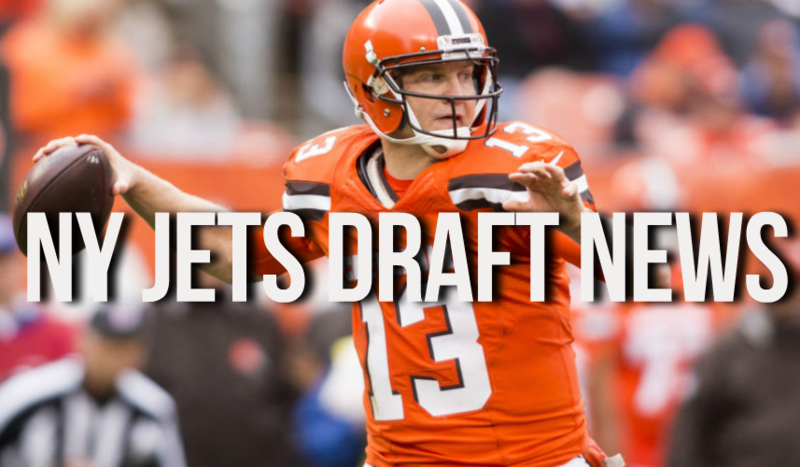 The New York Jets signed 13-year veteran Josh McCown in the offseason. You may have heard it in other sports, the NBA particularly. Teams start to pack it in as the season’s schedule winds down and lose games on purpose. Doing so assures that the team will be rewarded with a high draft pick the following season. Some have accused the Philadelphia 76ers of doing just that. The Sixers do not care. They have had three Top 3 picks in the last three seasons and appear to have the necessary tools to rebuild the franchise. In the National Football League, the idea of tanking a season seems ridiculous. However it may be exactly what the New York Jets need to rebuild. Now, tanking an NFL season is much more difficult than in any of the other major sports. There are only 16 games on the schedule compared to 82 in the NBA and NHL and 162 in Major League Baseball. Even a team as bad as the Jets can find a way to beat the mediocre teams on their schedule and win four or five games. The Jets, who were not particularly good last season, managed to win five games. The 5-11 season was the franchise’s sixth in a row without a playoff berth. New York has managed just one winning season – head coach Todd Bowles led the Jets to a 10-6 mark in his first season in 2015 – in the last six years. In the past decade, a team with one of the top three picks in the draft has not won more than seven games in a season. Most of those teams won three games or fewer. Over the same decade, the team with the top pick in the draft has won more than two games only once. With rosters of 53 players and a staff of coaches that can number into the 20's, every week in the NFL is a job interview. Think about Bowles. After the 10-6 first season, he went 5-11 and was almost fired. Is he going to tank in 2017 just to ensure his team gets the No. 1 pick in the draft? It’s unlikely, but the Jets appear to be headed in that direction. The Jets personnel department has dumped a wealth of experience and talent as the team readies for the start of this year’s training camp. Jets owner Woody Johnson and general manager Mike Maccagnan began their purge earlier this year. Center Nick Mangold, a first-round draft pick who played his entire 11-year NFL career with the Jets, was let go in February. A seven-time Pro Bowler, Mangold missed four games in midseason last year. He returned, and then re-injured his ankle before being placed on injured reserve in December. Along with Mangold, cornerback Darrelle Revis, also a seven-time Pro Bowl selection, was released by the Jets just a few days later. Recognized as one of the best corners in the game, Revis started 15 games last season. However he is on the downside of a very strong career. The New York Jets roster purge continued in the offseason with guard Breno Giacomini, kicker Nick Folk, and wide receiver Brandon Marshall. Then, in early June the Jets announced that they would be releasing veteran linebacker David Harris and would be attempting to trade wide receiver Eric Decker. Harris, like Mangold, played his entire NFL career in New York. He became a starter as a rookie and was key part of the Jets defense over the last decade. Harris was picked up by the New England Patriots and Decker, who was eventually released, signed with the Tennessee Titans recently. The idea for Johnson and Maccagnan is to move towards youth. The Jets have, in their opinion, shed guys who are at or past their peak in an effort to rebuild the roster. What they have also done is to free up nearly $70 million in available salary cap space for 2018. What does that mean? Well, the Jets could become very active in next year’s offseason free agent market. They could also become a key player in the 2018 draft. The Jets had nine picks in this year’s draft and will have eight in 2018. New York could take a page from the Cleveland playbook and acquire more draft picks to add youth to their roster. Regardless of how they do it, the Jets are aiming for one position in particular – quarterback. It’s no secret that the New York Jets haven’t had a top caliber quarterback in years. Since Brett Favre started all 16 games in 2008, the Jets have been through Mark Sanchez, Geno Smith, and Ryan Fitzpatrick as well as Kellen Clemens, Greg McElroy, Michael Vick, and Bryce Petty. In each year from 2013 to 2016, the Jets drafted a quarterback. It was Smith in 2013, Clemson’s Tajh Boyd, who didn’t make the roster, in 2014; Petty in 2015, and Christian Hackenberg in 2016. Petty started the final four games last season. However neither he nor Hackenberg appear to be the quarterback of the future. The Jets signed 13-year veteran Josh McCown in the offseason and he will likely be the starter heading into 2017. With that in mind, Johnson and Maccagnan have their mind on next year’s quarterback crop. And it’s a good one. Like 2015 and 2016, the top two picks in the 2018 draft could be quarterbacks. USC’s Sam Darnold, UCLA’s Josh Rosen, and Wyoming’s Josh Allen lead a class of signal callers that will be one of the best in recent memory. In a quarterback-driven league, rebuilding a franchise starts at the position. The Jets, with their new streamlined youth-heavy roster, could play themselves into contention for one of those three quarterbacks. In the past decade, a team with one of the top three picks in the draft has not won more than seven games in a season. Most of those teams won three games or fewer. Over the same decade, the team with the top pick in the draft has won more than two games only once. If the New York Jets are going to pack it in and give up on the 2017 season, then they are likely going to continue their futility in 2018. Can Johnson, Maccagnan, and the rest of the Jets front office wait until 2019 to win? Will Jets’ fans put up with two more seasons of no postseason hopes? Likely not, but it takes time to build a winner, whether you tank a season or not. The Oakland Raiders are on the Clock in the 2019 NFL Draft? Derek Carr Sparks Dueling Contracts, Or Does He?